To all of you that checked out the facebook live last month, thanks for joining! February is kicking off a month of serious wellness for me for several reasons. First of all, it’s cancer prevention month. I’ll be writing about that more soon. Secondly, I’m reading more about fertility and seeing what I can do to have the best possible chances with that process, so I’m working from the inside out. And finally, I’m looking at my skin after traveling and “winter” and “age” and seeing what I can do about it! All the three of these things have something in common that jumped out at me. DRINK MORE WATER. So, this brings us back to my facebook live about water. If I’m going to be drinking more, might as well make it convenient and the highest, purest quality. I looked at the comments and outlined the main questions that were asked. If you missed the live, I’ll be doing one another (hopefully getting better at them). But, if you wanna peek at this one, you can watch it on my page HERE. If I am curious about water filtration, where’s the best place to start? How much was our exact model? Prices range according to your needs. An over the counter one starts relatively low. Click to check it out and get free shipping on models like mine and also a second year filter for free. If you feel you are in a similar situation to mine, I highly recommend looking into this model. Please ask me if you have questions because the company will chime in and help me answer. How often do you need to change the filter? Is this better than well water? Well water quality should be tested before consumption. It can be incredibly pure or highly contaminated. Home Masters does make well water systems. Please test first - get the right tool for the job! How do I hook up a frig filter without buying a whole system? Your fridge filter is basic filtration, and while better than nothing, its filtration capacity is limited. The Home Master Artesian -- Full Contact Reverse Osmosis System produces slightly alkaline Mineral Water on Tap® by first stripping the water clean, removing 98% of contaminants using the reverse osmosis (RO) process, then channeling the water through the advanced remineralization filter twice using our patented Full Contact Technology to rejuvenate and restore 30-60 mg/L calcium and magnesium minerals. It’s an entirely natural process - just like rainwater passing through the earth. Yes – you can install a Home Master RO system to directly feed just your refrigerator’s water and ice dispenser. 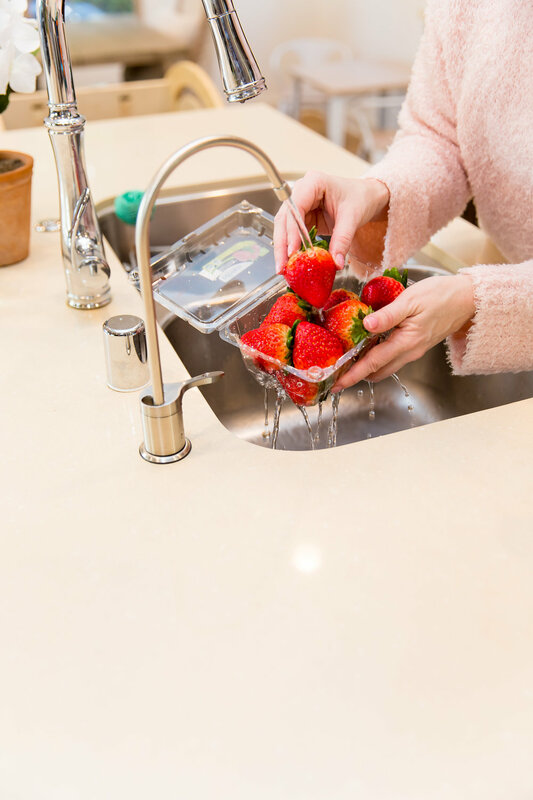 However, in order to do so you’ll need to flush out the system from time to time and so its handy to have a way to get the waste water in your sink or a bucket. You don’t want the flush water getting into your fridge because it’s a bear flushing out your fridge and ice maker. Get the Refrigerator Connection Kit and use the Inline Ball Valve 3/8” as your termination and flush point under your sink. Do I need to drill a hole for the RO faucet? Can I mount the Home Master RO in the basement? What are benefits of drinking filtered cold water out of the fridge? All the same benefits of water, but cold BURNS CALORIES. Um…Ok. Sold. I’m renting and may move, so what is easy to take with me and affordable? Any other questions, please ask and I’ll add them here for us to reference. Do you already have a filter? If so, I wanna hear about it! If not, are you thinking about one? Happy Thursday, y’all. Make it a special one.💫 so tired today, but gonna put on 💄and a great attitude and keep going! (I accidentally posted this, deleted it, then reposted so it’s that kinda morning! )🤦🏼‍♀️🤦🏼‍♀️🤦🏼‍♀️ anyway.... Throwing back to a meeting last week where I only needed two things in my back pocket: my pass to get on the lot, and @tightlipd lipgloss packets. 💋💋💄It was a good meeting, so fingers crossed! 🤞🏼🤞🏼😉 Ps- tag a friend who needs a #onthego #pursefree lipgloss:) I’ll send a few of you all some to try!! My baby sister is 30! @jordynschatte You were the joy of our lives when you were born. And the joy of our lives today (well, you share that position with Hayden and Huck now;) Enjoy your thirties, my darling...old enough to look back, young enough to look forward! This is your decade, Mrs. Schatte. Proverbs 31:25-31 She is clothed with strength and dignity, and she laughs without fear of the future. ❤️ Can’t wait to see what all God has in store for you. I LOVE YOU. Ps- happy belated birthday! !